Weldfabulous has stainless steel cleaning and polishing solutions for welding applications. Surfox Electrochemical weld cleaning system for stainless steel, is a safer, cleaner, more efficient way to clean your stainless steel welds. 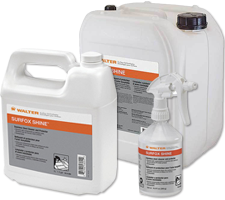 Surfox by Walter Abrasives products are available in a variety of sizes from 500ml spray bottle to 20 liter bulk jugs.